I did something yesterday that I haven’t done in about 35 years. I took a cooking class. The last time I had formal cooking lessons was when I was in junior high school. In exchange for being allowed to use one of my class periods to work the the school office (for free and where I learned to file), I agreed that I would also take home economics (what is now understood as domestic science). In my school home economics involved learning to sew from a pattern, and some very basic cooking skills. We learned, for example, how to overcook minced beef and the proper doneness of green beans. Yesterday’s lesson was somewhat more inspiring. 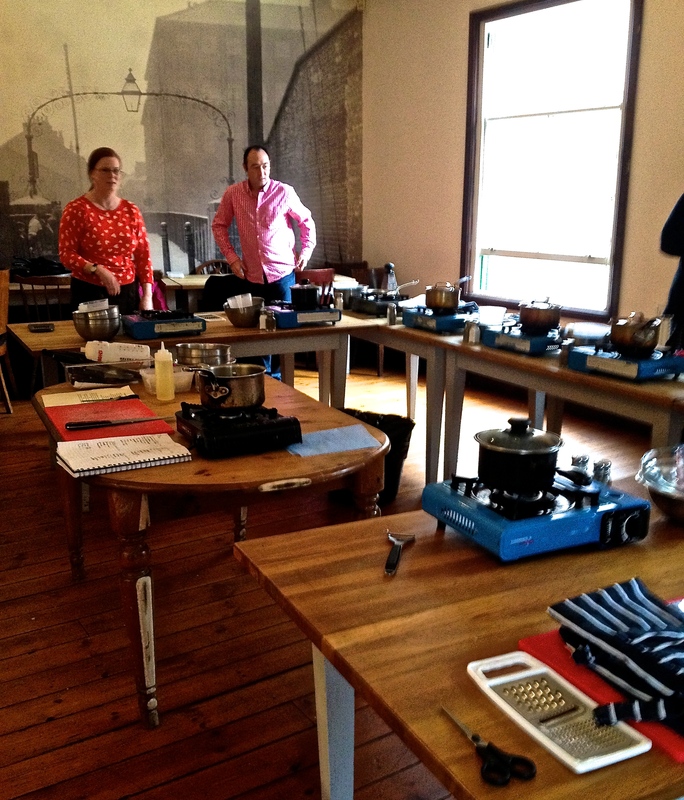 The course was offered by a local Sheffield restaurant called The Milestone. The Milestone’s philosophy is to use locally sourced, ethically grown/reared food. The cuisine is largely British with a hint of Continental influence, and they have won a number of awards including winning Best British Restaurant in Gordon Ramsay’s television competition (see this link). The Milestone offers either full or half day courses nearly every Saturday and the titles range from “Knife skills”, “Meat”, “Bread” and “Fish”, to the somewhat adventurous sounding “Pig in a Day” and “Bacon, Sausage, and Black Pudding”. The course I took was called “Cook from the Book” and focused on recipes from their cookbook. Over the course of about three hours we learned to make four dishes: Curried Cauliflower Soup; Trout Cooked in a Bag with Aromatics; Butternut Squash and Orange Risotto; and Mussels, Leeks and Bacon. The cooking was done mostly on equipment that you might take camping with you, which reinforced the idea for me that quite a bit of adventurous cooking can be done with limited equipment. Now I would not call these dishes particularly adventurous, but I did hear a number of people comment that they enjoyed doing the course because the food was “different”. 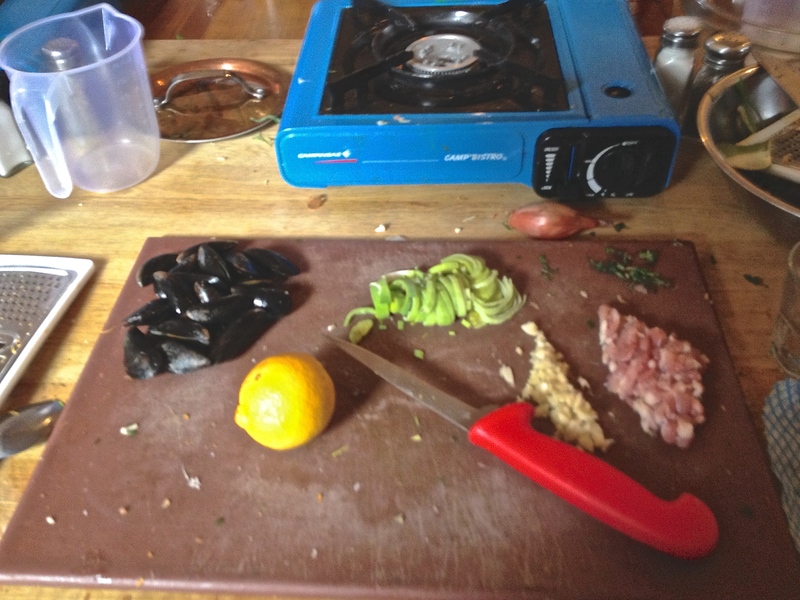 It was also clear that both risotto and mussels were new tastes for many people. Given that the course costs £65 and that it seemed to be mostly couples attending, it is clear that these are folk who have some disposable income, so the comments were a bit of a surprise to me (I thought risotto was a fairly ordinary food). Thinking back, however, to my formal kitchen learning I guess I should not be surprised that so many in the room were experiencing these foods for the first time. Certainly they would not have learned them at school, and upon reflection I realise that what I take as normal understandings comes from learning. My knowledge comes only because of my own curiosity, the fact that I worked in good restaurants all through high school and university (and given I attended university for about a decade that is a fairly long time), and perhaps most importantly because my parents were keen on exposure (I’ve talked about exposure in this post). Clearly a Bourdieu-ian distinction. Had I known in advance that the course would focus on these four dishes I probably would not have signed up; cauliflower is not my favourite and I already know how to make the other dishes. I am glad though that I did not know in advance as I did learn some things. When making the soup I learned that a pinch of salt added to the onions helps the release the sugars and reduces bitterness. I learned the proper technique for filleting a fish, or perhaps I should say I learned that I need to take the knife skills course. Had I been making the fish dish at home I would have put the whole thing in the bag. When making the risotto I also learned that after that initial stage of frying the rice, a splash of wine deglazes the pan and helps introduce a nutty, toasted flavour. It is after this stage that you begin to introduce the broth or water. With the mussels I learned a tapping technique for determining if they are dead. All useful. I am also glad I went, because it was a fun thing to do. What struck me about the way that we were taught to cook, however, was this emphasis on technical skill. Largely, though not entirely, missing from the instruction was learning about how to use your senses in the preparation of food. We were encouraged to taste the food after it was cooked, but there were not moments when the chef said taste this now and adjust your seasoning, it should taste like… I couldn’t help feeling as I made the soup that I was doing it blind as the instructor made no comments about colour or smell or taste. I wondered at several moments if it looked right and when it was finished I found that it was overly bland and wish I had added more curry and I thought it could bear some coriander as well. We did not taste or smell the dish at any point when we were making it. There addition of orange to the risotto was interesting and not a taste combination I would have considered on my own. I would have liked to know a bit more about why that worked and if a bit of mint would have been better than the parsley or at least a good addition. I kept thinking that the people who don’t have the familiarity with these dishes would not have the skill to then go home and modify as the discussion of taste combinations was not included. Likewise, the visual aspects of the risotto were emphasised: “add water when the rice begins to look dry” and “when it is finished the dish will look creamy”, but the haptic aspects of stirring were not elaborated. I suspect my limited knife skill has something to do with not knowing how it should feel to cut through the skin and flesh of the raw fish and when one is too close to bones (and the fact that the knife I was given was quite dull). Cooking, for me, is an embodied activity and as such requires the engagement of all the senses in order to be a success. Perhaps we should blame the loss of embodied learning practices on the fact that cooking in school is called “home economics” or “domestic science”. At the end of the day, the dishes I preferred were the risotto and the mussels. I would make both again and I certainly would take another course from The Milestone. 100 g Arborio Rise (at £2.20 per kilo it is more expensive than the £.45 for regular long grain rice, but it does matter). In pan add oil to cover the base. Sweat the onion and garlic with a pinch of salt on a medium heat. You want to soften not introduce colour. Add the rice and stir to coat all the grains in the oil. It will begin to brown a bit and stick to the bottom of the pan. When this happens splash in a good dash of wine to deglaze the pan. Add in a bit of water or stock (maybe a 1/4 cup) and give it a quick stir. When it looks as thought the water is mostly gone repeat the process. You can add wine instead of water or stock in the later stages of the cooking process. After about 8 minutes or so, test the rice by bitting it between your front teeth. If it tastes chalky or is still firm cook a bit longer. You want it to look creamy and be only just firm to the bite. Now add your grated squash and stir to finish cooking the rice. Take off the heat and add a bit of butter. Stir fairly vigorously, then add the orange and juice, and the parmesan and stir again. The process of stirring breaks down the rice and contributes to the creamy texture. Taste. It should taste and feel balanced between creamy, nutty with a bit of an citrus kick. If it tastes bland add a bit of salt and pepper as these spices will bring out the other flavours. Add the herbs (parsley, mint, etc.) at the very end as you only want to release the aromatics. Garnish with a couple of orange pieces and a bit of parsley or a mint leaf. This entry was posted in Food, Recipe, Social Positions, UK and tagged cookery, kinesthetic cooking, recipe, Risotto, senses, Sheffield, The Milestone by geofoodie. Bookmark the permalink.